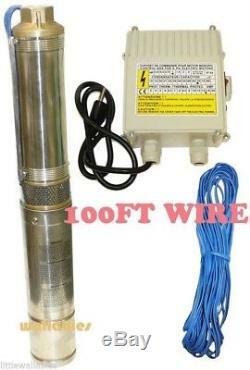 Stainless Steel 3HP Deep Bore Submersible Well Pump 17GPM 220V. Operating conditions: -Liquid temperature up to 40 o C -Submersion depth 40m -Minimum internal diameter of well: 102mm. Motor: -Tow-pole induction motor n=3450r. M -Built-in over load motor protector (this will kick the breaker when over heating if using in muddy or sand water) Only used for Clear Water. Insulation Class B/F -Protection IP68 Material: -External pump body: Stainless Steel -Suction strainer: Stainless Steel -Impeller and diffusors: Noryl -Bearing brackets: Brass -Shaft: Stainless Steel -Motor housing: Stainless Steel -Mechanical seal: Ceramic/Graphite Application: -Multistage submersible water pumps with radial closed impeller conceived in order to solve any problem of clean water conveyance. Suitable for irrigation, and pressure systems and pressure systems and generally for civil and industrial purposes. For water supply from wells or reservoirs, domestic use, civil and industrial applications and for garden use and irrigation. This pump is only for Clear water pump. Will not work on Muddy clouded water, will cause the control box to kick off the power. Industrial standard, stainless steel housing. 3hp 2200W, 3450 RPM MUST INSTALL WITH 25AMP BREAKER. 220v 60hz Require 20amp dedicate breaker. Comes with control box featuring: manual On/Off switch, motor overload/thermal protection, 20uf/450v capacitor in the box. Max dept: 393 ft (120M). Max Capacity Flow: 1050 GPH(4000 L/H). The Rubik's Cube is a three-dimensional twisty puzzle. Learn the easiest Rubik's Cube solution here. Text composed with the best online HTML editor. Please subscribe for a HTML G membership to remove similar messages from the edited documents. Please make sure you order the correct item as orders cannot be altered after the order is paid for. 5-8 days to your door, we do not guarantee transit time. Excluded AK, HI, PR, APO, GUAM, VI, or PO Box. The flat rates quoted in the table will apply to most destinations in the countries/states listed. Occasionally (usually, but not always in remote/rural areas), some addresses will not qualify for the service or rates that are quoted. We reserve the right to cancel an order or terminate a sale for any reason. All items are 100% brand-new, and not refurbished in any way, unless the listing specifically states otherwise. Boxes may be opened for the purpose of testing, inspecting, photographing, adding additional padding/packaging/instruction supplements, or ensuring the completeness of the item. Customers must return all items in their original condition which include the original Packaging accompanied with packing slip, Documentation & Manuals and Accessories, etc. We welcome and treasure all of our customers. The item "Stainless Steel 3HP Deep Bore Submersible Well Pump 17GPM 220V" is in sale since Tuesday, October 25, 2016. This item is in the category "Home & Garden\Home Improvement\Plumbing & Fixtures\Pumps". The seller is "wallabytools" and is located in City of Industry, California. This item can be shipped to United States, Canada, United Kingdom, Denmark, Romania, Slovakia, Bulgaria, Czech republic, Finland, Hungary, Latvia, Lithuania, Malta, Estonia, Australia, Greece, Portugal, Cyprus, Slovenia, Sweden, Belgium, France, Ireland, Netherlands, Poland, Spain, Italy, Germany, Austria, Mexico, New Zealand, Switzerland, Norway, Ukraine, Croatia, Costa rica.